option for fully enrolled Red Cedar Zen members. Cancelled due to scheduling issues. We hope to reschedule the ceremony in the Fall. A ceremony to mourn the passing of children who have died. The loss of a child impacts our lives indelibly. No matter how the child dies, born or unborn, whether through illness, accident, miscarriage, abortion or suicide, our sorrow is deep and may be long-lasting. Jizo Bodhisattva is a Buddhist figure known as the guardian of children, women and travelers, and particularly of children crossing over from this life. 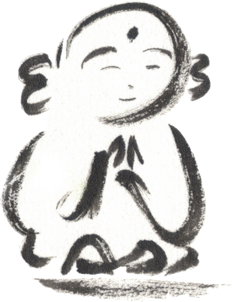 The Jizo Ceremony is a traditional Buddhist ceremony that allows family and friends to give time and space to open to our grief and acknowledge the children whose passings have touched our lives so deeply. Facilitated by Zen priests and teachers Ryushin Andrea Thach and Nomon Tim Burnett of Red Cedar Zen Community.